Choices Agency Anywhere™ ACORD Forms can be filled-in, saved, signed, grouped, sorted, combined and emailed. No installation is required. For instant access, view the video below, then click the blue "SIGN-IN/REGISTER" button. 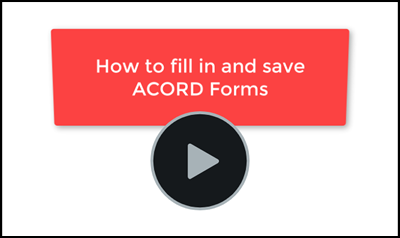 ACORD Forms are standardized insurance forms used by agents and companies. Choices has been an authorized ACORD Forms distributor for 30 years. Standards for ACORD Forms are set by ACORD. Large agency management systems are not designed for your insurance agency. They are designed for all insurance agencies. The result is that they are large, cumbersome, and require constant training. A common user complaint is: "We never use 95% of our system". Your system should only include what you need. Choices Agency Anywhere™ software allows you to choose and pay for only the features that you need. As your insurance agency grows, you can add features at your own pace, saving time and money. See our pricing page. ACORD 61 SC - South Carolina Auto Supplement, Offer of Optional UM/UIM Coverage. ACORD 68 NY - New York Liability Supplement - "Claims-Made Policy"
Software-as-a-service is a good disaster recovery, because everything is available via the Internet. I can log in from anywhere. Additionally, when I visit a client, as long as they have Wi-Fi, I can log into our system on my laptop. Choices does everything that I need, and in terms of affordability, no one can touch the price. I studied 18 different products and yours was by far the best value. We've used three ACORD Form packages, and yours is the best. It has helped improve productivity tremendously. I was skeptical at first...but after your telephone demo of the product, I realized I hit the jackpot! I have been looking for software for months and am pleased to have finally found what I need. We have been using Choices software since we started in 2000. It is simple to use, very well priced and extremely effective and versatile at managing our book of business. I highly recommend Choices Software! There is no better value out there for your agency software dollar. We can issue a Certificate in five minutes. We are able to search by contract number, find the most current Certificate, and print it off…it's very quick. I've worked with other software companies, and speaking from experience, I can tell you it can be very frustrating. Choices is very quick to meet our demands; they've always found a way to meet our needs, and are very responsive. I've never gone 24 hours without a personal call back. Agency Anywhere is cost-effective and it works for you. Dean seems to have the big picture on the agency business, not just a limited knowledge of a software product. Choices' customer service is very good. I enjoy working with Dean and his staff. If we have a question or problem, they've always been able to work something out. We may have trouble that has nothing to do with Choices – like an equipment issue or a printer problem or operating system problem – and they will help with that, too. © 2018 Copyright: Choices Software, Inc.